To use the Web HMI Dashboard you must first register the Web HMI libraries. This is done with the OAS Service Control Manager with the Web HMI Registration (highlighted below). Define the exclusive Node Name and Port Number that is to be supported. The Node Name should be the registered domain name, IP address, or network node name that all clients will connect to from their browsers. It can also be left as localhost. The Port number is set to 58725 by default, but can be changed to any available port on the server. You may also select Use SSL if you choose to require an SSL connection for all Web HMI communications, including the Web HMI Dashboard. If you choose to use SSL, you must select which SSL Certificate to use with the service. 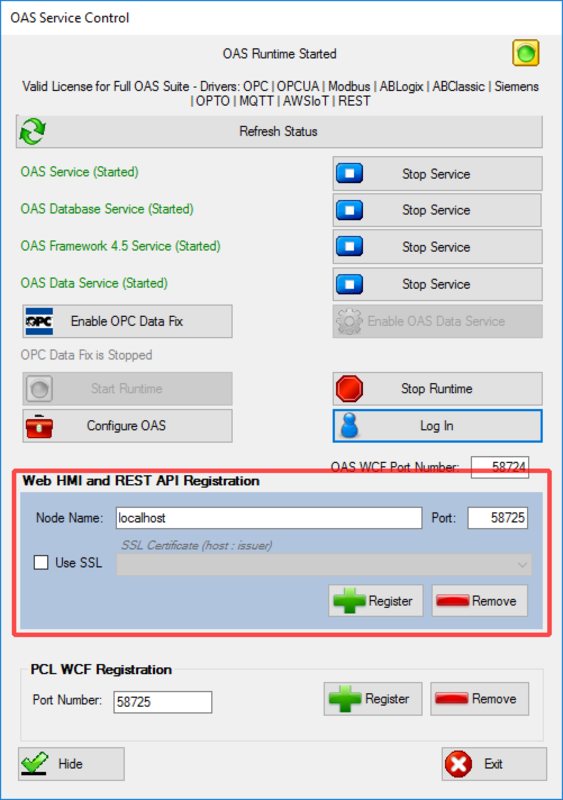 SSL requires that a server certificate be present and installed on the server where the OAS Services are installed. Once you have configured the Web HMI Registration fields using your desired settings, click Register to set the server registration. If your services are running, you will be asked if you would like the services to be stopped, as it is required for the registration to be completed. 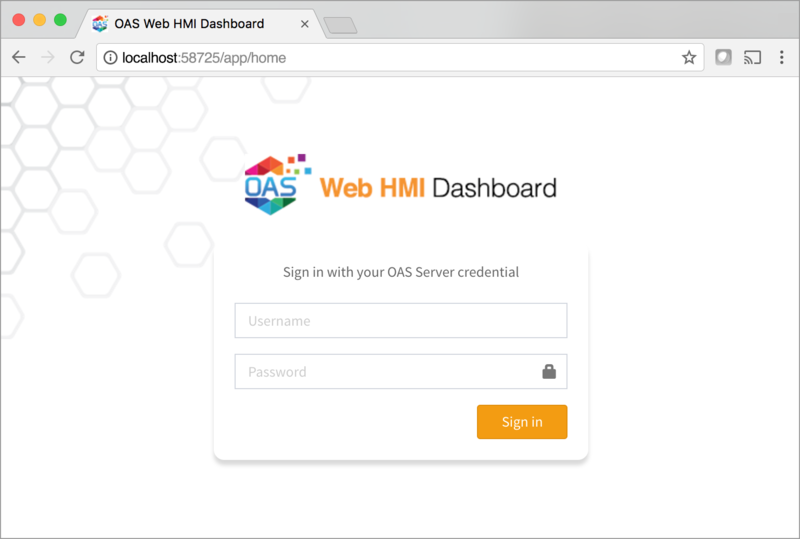 Once presented with the Web HMI Dashboard login screen, enter in an OAS server credential, or leave blank to use the default server credential and click “Sign In“. Upon successfully logging in, you will be presented with your personalized Web HMI Dashboard. 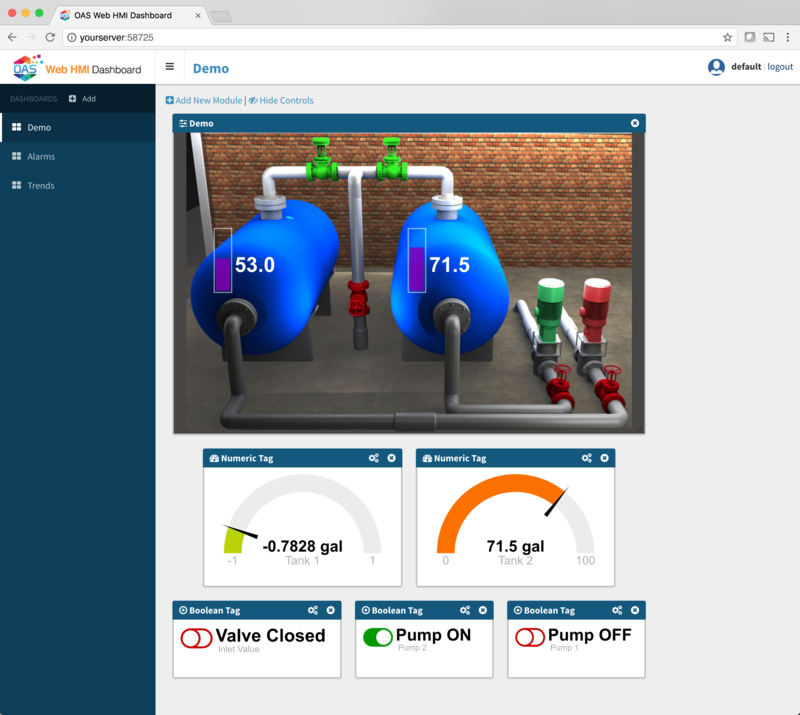 If the application is in Demo Mode, you will be provided with some demo dashboards and you will see live data flowing into each module. All modifications to your dashboard will be saved within your login and remembered for your next session.